History piercing old as mankind. Punctures parts of the human body are symbolic: have hidden meanings in different cultures and as a proof of the fact that a man can tolerate a lot of pain as well. In modern civilized society, the piercing is purely aesthetic character, and therefore an unpleasant necessity to bear the pain disappeared. Punctures are invasive procedures, are therefore an increased risk of blood poisoning, it can be dangerous or even fatal. Ear piercing can be beneficial to your health, in addition, accessories and jewelry adorn and give the image of elegance. However, the approach to puncture the ears must be armed with the knowledge of the acupuncture points related to different bodies and special equipment. 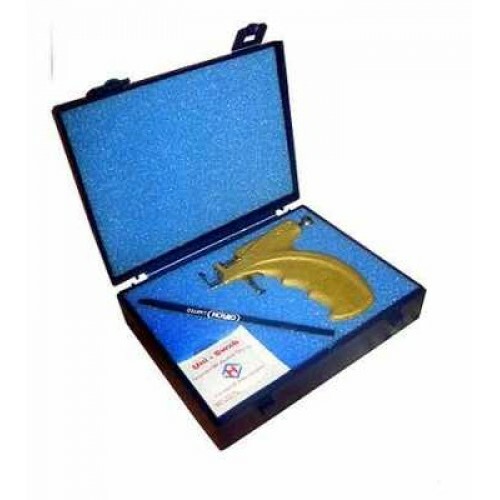 Anesthetize and secure procedure for piercing the ears will help specially designed gun Caflon Gold. Puncture wound, made a Certified caflon gun is faster at 10-15%, and the speed of manipulation minimizes pain. Caflon-gun equipped with three attachments, training disks, antiseptic wipes, and a marker. This kit allows to perform piercing punctures in the salon and at home. The device has a handle and relief rough coating for reliable holding it in his hand during the procedure, and the basis of the medical alloy makes it reliable and durable.